The Walt Disney Classics Collection premiered at the South Bend Collectible Show in the US in July 1992. 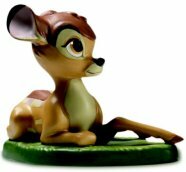 It was the first time that the Disney Company has produced on their own a line, previously Disney had licensed other companies to produce Disney figures. 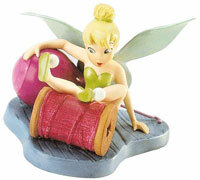 Pictured right is “Tinker Bell: Little Charmer” the membership gift sculpture for 2001. The quality and increasing values of the limited edition and retired figures has attracted a large number collectors all over the world. The figurines are made of porcelain, with individual pieces molded together, and fired in an oven. They are then painted and fired again. Pieces spend months, sometimes years in production so the final sculpture resembles as much as possible the original character in the movie. They have been very successful in achieving an authentic look and feel to the figurines. Pictured left is “Bambi, The Young Prince” the membership gift sculpture for 2004. Each figurine has a backstamp, signifying the year it was produced. The marks represent significant milestones in Disney history. The 2000 mark was a feather. Previous marks have included Sorcerer’s Hat (1999), Pickax (1998), Music Stand (1997), Donald Duck’s Hat (1996), Practical Pig’s Trowel (1995), Dancing Flower (1994), Treble Clef (1993), and the first year 1992 was a Wheel, a tribute to the first Mickey Mouse cartoon Steamboat Willie. Pictured right is “Millennium Mickey: On Top of the World” the membership gift sculpture for 2000. 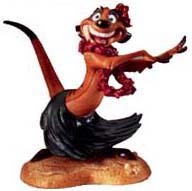 The first sculptures were from three scenes, Bambi, Cinderella, and Fantasia’s Sorcerer Apprentice. Many collections have followed including limited editions, and many pieces have been retired. Pictured left is “Little Lady” the membership gift sculpture for 1999. In 1995 Disney launched the Enchanted Places, background scenes from the most popular animated films. 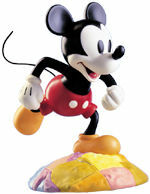 To accompany the Enchanted Places series, Disney introduced (in 1996) miniature figures, designed by world renowned miniature artist Robert Olszewski. Please note that the above dates are correct for the US, but at present there is a considerable time lag before some pieces reach the UK and Europe. In January 1993, Disney introduced the Walt Disney Collectors Society. The Society has grown to well over 60,000 members. Membership benefits include a free joining figurine. Membership also includes subscription to the quarterly WDCC magazine “Sketches”, a quarterly newsletter “Newsflash”, the opportunity to buy members-only figurines, a cloisonne membership pin, a membership card, and a lithograph. Pictured right is Timon “Luau!” the membership gift sculpture for 1998. NOTICE – This site is not affiliated or associated in any way with Disney TM. 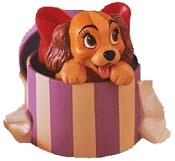 The purpose of these pages is to provide information to collectors of the Walt Disney Classics Collection.